"Folks, it's the print vehicle that's going away, not the brand." Back in the 70's, I complained about writers who confused schizophrenia -- a crippling condition that afflicts many people -- with multiple-personality disorder, a crippling condition that rarely afflicts anyone outside Hollywood. To this day, intelligent people who suffer from an even more prevalent disorder -- let's call it psychological illiteracy -- do not know the difference. The Unofficial Adam Sandler Project is an effort by a group of Hollywood writer-directors - with all the ego that little hyphen implies - to exploit Sandler's undeniable screen presence while redirecting his acting energies from autistic to artistic. Full disclosure: someone very close to me is on the autism spectrum, so perhaps I am more sensitive than others to the glib and careless way that Newman uses the word autistic. And I don't mean to get all PC on Newman. He's a writer, and he has artistic license to use words both literally and metaphorically. But I would urge journalists to use this word more precisely. Autism today, like schizophrenia years ago, is the focus of an important public and community discussion that will affect the lives of many people. And we're talking about real people ... not Happy Gilmore, not the Waterboy, nor any other Adam Sandler character who has annoyed filmgoers and film critics over the years. Update: Doom and Gloom in the World of Media? First we got the bad news about InfoWorld. Now we're hearing about trouble at the Chronicle, one of the biggest media properties in my hometown. Serious stuff, and I plan to write this general topic very soon. It also touches on some of the work that I am doing on behalf of Hubbub client FAST. The media industry is reorganizing to better compete in the post-Google world. There will be winners and losers. In the meantime, let's not overreact to the doom and gloom ... or the early reports. Last time I looked at InfoWorld, for example, the online piece of the business was growing fast. The safe bet is that MSM is undergoing a metamorphosis, rather than "going down without a fight." Now, I don't want to sound glib about print's demise. I've worked on print publications for nearly 30 years, and I enjoy the physical feel of a magazine, its portability, the way you can spread it out in your lap and dog ear pages for future visits. Online bookmarks may be more efficient, site searches retrieve information faster, but it's hard to beat a magazine for its tactility and visceral thrill. On a personal note, I'll miss creating covers, working with my art director and other editors to develop a concept, then reviewing the sketches and tweaking until everything works. And it's hard to imagine I'll never have to create another InfoWorld "coverline" -- the only-in-magazine-style type that graces each cover, combining equal parts information and tease. For an editor, few jobs are as satisfying, especially when the finished product arrives, all shiny and new. InfoWorld, though, is a for-profit business not unlike the businesses many of you run or work for. I am an editor, which means I answer to the readers, not the advertisers. That will never change. Nonetheless, I also know how the business works, or in some cases, doesn't work. The ad-driven economic model that supported print magazines for years (publishers deliver a steady stream of highly qualified readers, and advertisers pay for the privilege of putting ads in front of them) is unraveling. Given the alternative, advertisers want more immediate gratification and measureable results than print can afford them. On the Web, they can know who and how many people are viewing their message; they can target specific audiences and know exactly what they are getting. They can engage potential customers directly in ways print magazines never allowed. There's no more guesswork. [This blog] will critique emerging events against a positive vision for where news “ought” to be headed, to regain some of the ground lost since Thomas Jefferson’s passing. Jefferson’s hope was for news in America to be a freewheeling marketplace of ideas in which many disparate voices were heard, with government policy dictated and its actions controlled by the sum of individual opinions. But, shortly after his death, America inadvertently began to shift in reverse due to a combination of technology, government action, journalism theory, and a few, arguably anti-competitive, business practices. I look forward to reading this blog. Very timely -- the news is in the news quite a bit these days. And it's a topic that's near and dear to me. Tomorrow morning, I'm moderating a panel that includes Craig Newmark, a man who has forced newspapers to take a hard look at their businesses. I believe that this will be a year for lots of experimentation in the newsroom. Looks like Boriss will be chronicling that story. The point here is that if you’re a journalist and have an opportunity to make a contribution to your career, your company or to our industry through programming, don’t let the math thing scare you. You can do it. Eighty percent of programming (if my math is right) is easy. If I can do it, you can. Reminds me: Stephen Baker at Business Week is writing a book about the ascendance of math in business. Wonder if he will talk about journalism. In the meantime, recall what Stephen said in his January 2006 cover story, "Math Will Rock Your World." You may not need to learn math, but more and more we are living at a time where it pays to be a quant. The world is moving into a new age of numbers. Partnerships between mathematicians and computer scientists are bulling into whole new domains of business and imposing the efficiencies of math. This has happened before. In past decades, the marriage of higher math and computer modeling transformed science and engineering. Quants turned finance upside down a generation ago. And data miners plucked useful nuggets from vast consumer and business databases. But just look at where the mathematicians are now. They're helping to map out advertising campaigns, they're changing the nature of research in newsrooms and in biology labs, and they're enabling marketers to forge new one-on-one relationships with customers. As this occurs, more of the economy falls into the realm of numbers. Says James R. Schatz, chief of the mathematics research group at the National Security Agency: "There has never been a better time to be a mathematician." Advice to young folks contemplating a career? Know thyself -- you should love what you do, do what you love. But if you have an irrational fear of math and science, try to get over it. It can't hurt to learn a little about reason and numbers -- good for the mind, and good for almost any career -- and who knows, you might actually like it. 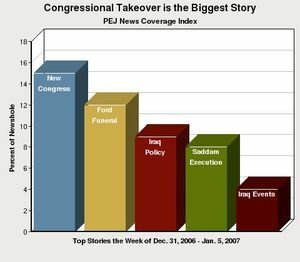 The PEJ’s News Coverage Index, which will be released every Tuesday, is an ongoing study of the news agenda of a wide swath of the American press, measuring the topics covered in 48 different outlets from five sectors of the American media. The Index is an attempt to provide an empirical look at what the media are and aren't covering, the trajectories of major stories and differences among news platforms. We believe it is the largest continuing study of the media agenda ever attempted. Reminds me of meme trackers like Memeorandum, but simpler, mainstream, (and not interactive). I'll be looking at the meming of life -- the good and the bad -- in a couple of weeks, and this comes just in time. Now that I am operating under a new business model -- I will be writing more on that subject in the next few weeks -- I am able to commit to more travel time with clients. I just got back from an old fashioned media tour -- to DC and NYC -- and we were fortunate enough to land meetings at some of the most fabled newsrooms on the Eastern seaboard. Our favorite? Close call, but for both me and my client it was The Washington Post where the newsroom today would be strikingly familiar to anyone who has seen All the President's Men, the Dustin Hoffman/Robert Redford buddy pic chronicling the making of the Watergate story. I visited the newsroom in the late '80s for a Columbia Journalism seminar on international reporting. It looked much the same then as it did during the Watergate era, and it looks much the same today, except for the sleek new computer panels that now grace practically every major news organization. BTW -- when the Watergate story first broke, the high-tech tool of the trade was the I.B.M. Selectric. But the basic design of the traditional newsroom -- open, and on a grid -- has survived, and there's little reason to tamper with it. In a word, it promotes "openness." Why did my client and I enjoy the visit to the Post so much? In a city where practically every street corner tells a story about our nation's history, the newsroom at the Post is perhaps the biggest national monument for anyone in the communications profession. Yes, there's quite a bit of mythology surrounding the events that led to the Post's coverage on Watergate. But there are few people who doubt that (a) it was here that our nation conducted one of its most important tests on freedom of the press, and (b) the outcome of that test continues to inspire young people to become journalists -- or serious bloggers -- today. On this tour, we met several outstanding young writers cut from the Woodward/Bernstein cloth, and we were excited -- and honored -- to make their acquaintance.